Osso Buco (also known as ossobuco, Italian for “bone with a hole”) is an amazing dish, but can definitely come off as intimidating for the occasional home cook. While it is often served at fancier restaurants, it is very easy to make at home—and can even be created using one dish! Osso buco is traditionally made with veal shanks, but in this case we’ve used beef. Additionally, the original version of this dish does not include any tomato, so it may be adapted for those on an autoimmune paleo protocol. Interestingly enough, there is a version that includes cinnamon as well. This is not the hands-down simplest preparation of osso buco, but trust me when I say this is worth the extra effort. You’ll spend about 15 minutes preparing ingredients, and then occasionally checking on it over 2 hours. We cooked this while making other food for the week, and it is amazing. Dice celery, carrot, and onion and set them aside for later. Prepare your bouquet garni and tie in cheesecloth. Heat 1/3 C avocado oil over medium-high heat in your dutch oven. Rinse and pat dry shanks; then salt and pepper both sides. Use kitchen twine to tie around the shanks to help keep the meat on the bone. This won’t guarantee it stays together, but it’s a helpful trick! 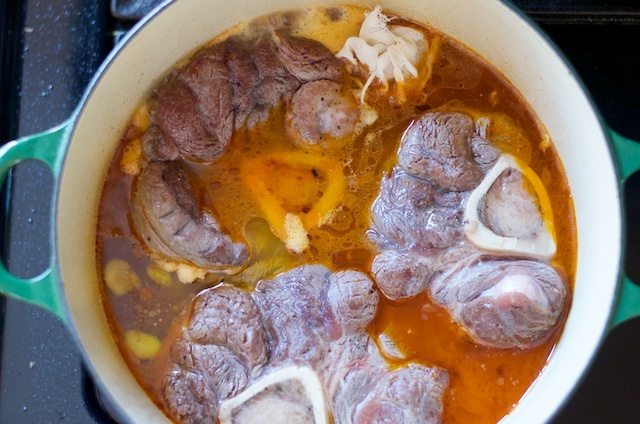 Sear the shanks in the dutch oven for 2-3 minutes per side, and set aside temporarily. Add in vegetables and mix until soft and translucent, about 5 minutes. Add in tomato paste (or skip to be autoimmune paleo friendly), and stir throughout. Return shanks to the dutch oven, add in vinegar/water mixture, and simmer until reduced in half, around 5 minutes. Next, add in chicken stock, ghee, and bouquet garni, and bring to a boil. Reduce heat to low, and cover. Cook 2 hours, flipping shanks every 15-20 minutes. Plate shank and pour sauce and vegetables over it. If you’re lucky, you’ll still have some bone marrow to indulge on as well! I hope this recipe encourages you to make osso buco for the first time, or try it again in a new way. This will feed two for 2-3 meals, and is worth the time in the kitchen. Thanks for stopping by; enjoy getting into the kitchen and putting together some delicious osso buco!